EDIT: As Bill B. and Caramdir point out in their comments after Bill B. produced his results posted below, more information is needed in order to make a better call. To remedy, my output was produced using MiKTeX 2.8 pdflatex with no special command line flags or switches. My pdf viewer is Adobe Acrobat Pro 9.0. The platform is Windows 7. All software including hyperref is fully up to date against the latest rev levels and patches. As I'm guessing that this is a pretty normal setup, at least in the Windows world, I'd be very interested (and grateful) in learning whether this problem affects other people or whether it's just some kind of rather weird one-off. My gut feel after seeing Bill B's results (and also after having traversed hyperref's code) is that the culprit is Adobe Acrobat or possibly MiKTeX pdflatex. Can anyone corroborate? I'd be very grateful to know. I have a problem with hyperref; it "enquotes" Author and Keywords (but not Title or Subject) metadata if the data sent to these contain a comma or semi-colon (but not, say, a full stop or a colon). I've included some figures and code that show this below. 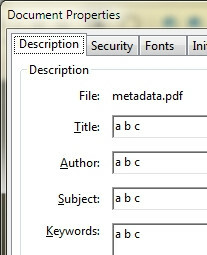 Press ctl-d (in Acrobat Reader) to see pdf file metadata. Not only is this quite ugly but, more importantly, it interferes with metadata extracting programs used by certain document repositories. I've worked my way through hyperref's code without much success. Would anyone have a solution for this problem? Or advice about what I might be doing wrong? I don't have any way to test using the software you're using. But I can tell you how to narrow it down - Divide and conquer. Look to see if the quotes are part of the string stored in the file. 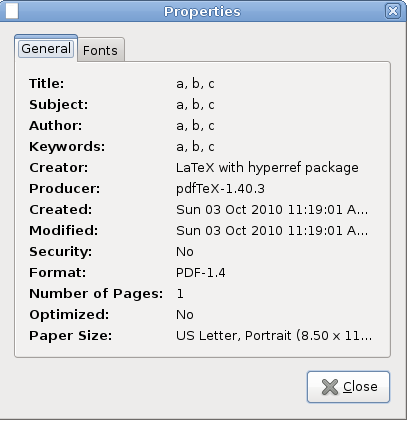 If the quotes aren't in the PDF, then the problem is with Acrobat. 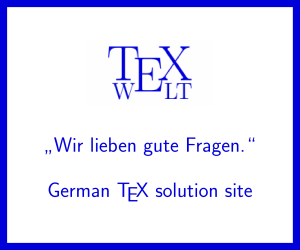 If the quotes are there, then the problem is on the MikTex side, either in the PDF generation, or perhaps something deeper into the Latex side of things. I'm afraid I don't have an answer for you. So, whatever the problem is, it must have something to do with your software version or configuration. I'm using Acrobat Reader on Windows Vista and I see the problem as you described it. (As you already found out, it is probably irrelevant that I'm using MiKTeX 2.7.) 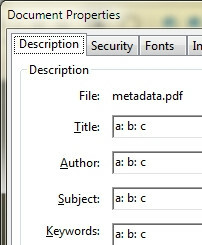 I do not have a solution for you, but another test to prove that Acrobat is indeed the culprit: Edit the pdf-file with an editor that can handle binary files, and replace the commas in /Author(a, b, c) with colons. This makes the quotes disappear. I fixed this issue by using the hyperxmp package. 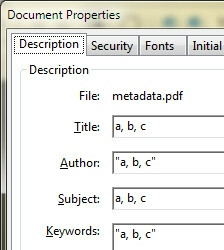 This package adds the metadata in such a format that Acrobat does not display quotation marks (tested with version DC 2015.009.20077). I noticed the same effect, it is definitely an artifact of Acrobat, not PDFLateX. 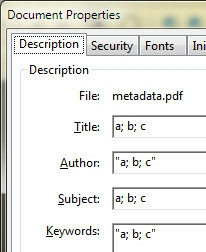 Acrobat displays quotes if the author field contains commas. Tried with Adobe Acrobat Pro 9.5.4. Not the answer you're looking for? Browse other questions tagged hyperref pdf viewers acrobat or ask your own question.